The tartness of the blackberries is mellowed out by the small amount of chocolate and the pie crust just melts in your mouth w/ the berries and chocolate! Stir in water a little at a time until you can make a ball and then separate it in two. Make one a little bigger than the other and use the bigger one for the bottom of the pie. Wrap the balls in plastic wrap and put in the fridge until you are done making the filling. 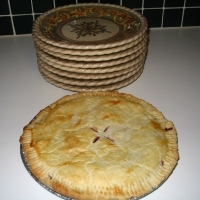 Roll out to fit a 9” pie plate…using a little extra flour on your surface, hands and rolling pin. You may want to put cold water on your hands if it is not doughy enough. Use your own judgment. Top w/ smaller crust, flute the edges w/ a fork, and make four slits in the middle of the pie. Bake @ 425˚ for 35 minutes. Chocolate and berries - that sounds interesting in a pie. Like turlak's recipes? Never miss an upload!